As my plane touched down in Athens on a warm and sunny October afternoon, it did not seem that long ago since the country experienced deep economic woes, during which a prolonged spat between the Greek Prime Minister Tsipras and then Finance Minister Yanis Varoufakis and the German Chancellor Angela Merkel over the EU bailout dominated the news for weeks on end, painting at times a bleak picture of a nation on the very brink of collapse and simmering with unrest. Not being totally impervious to these events, I was not sure what to expect when I booked the flights. But as I stepped off the plane, I did indeed look forward to finding out how Greece fared and forming my own opinions about the diving to be found here. 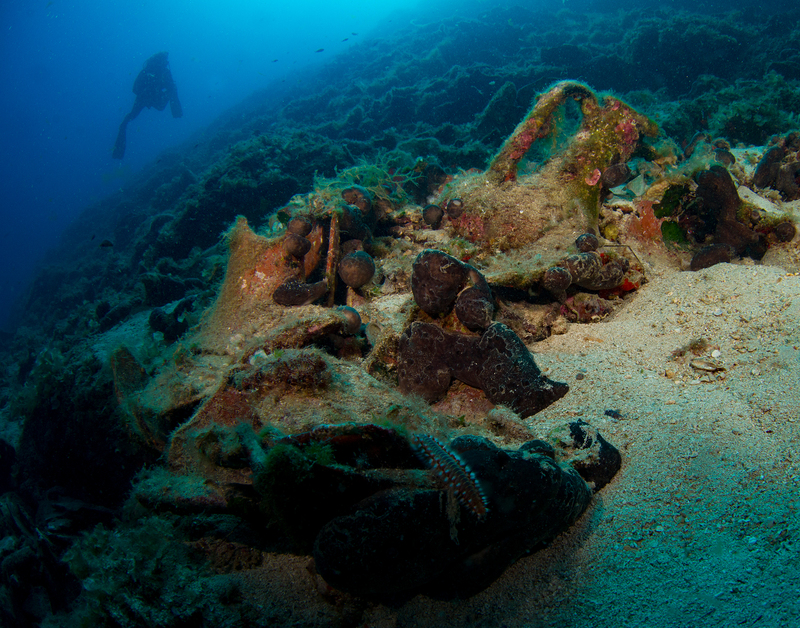 Ancient amphoras lay on the sea bed outside Rafti Bay, Greece. Photo by Peter Symes. First impressions, once on the ground, was that of apparent normalcy and a metropolis with a steady pulse—like any other major city. Nothing stood out as I was transferred to my hotel in downtown Athens. Traffic was busy and flowing, people were going shopping and visiting cafés and bars as they have always done—or so I presumed, being a visitor and casual observer with a limited frame of reference. As it turned out, I was in for quite a whirlwind of a ride over the next few days. That evening, the moon was rising over downtown Athens, as I stepped out on the balcony from my hotel room to take it all in. It boggled my mind that the scenery I was enjoying was the stage for so many formative events in Western history and culture. More than two millennia ago, this site was the birthplace of democracy, a power house for philosophy, science and many ground-breaking realisations. (I presume, as an attentive reader who has also paid attention in school, you would know what I am talking about.) So, I sat there, in the dusk, immersed in ponderings on time and history for quite a long while. Then again, I could not help it… Athens awoke the philosophical steak in me. The next morning, my Greek hosts took our dive party down to a location called Anavyssos on the coast, about a 1.5-hour drive south of Athens, on the western seaboard of Attica (the triangular peninsula jutting into the Aegean Sea). Off the highway, in a picturesque cove with azure-blue water framed by a rugged coastline of dry vegetation, the dive center Aqua Divers Club had its facility, tucked neatly under a restaurant overlooking the archipelago. Here, we were greeted by David White, an English expat with an infectious good mood and Eleni Siatra, one of the facility’ partners. At the jetty, a couple of powerful RIBs sat prepared to take us out on our first foray into the glittering Agean Sea. 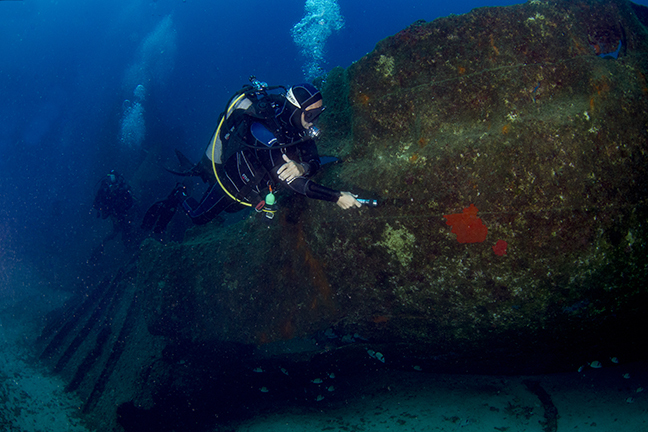 Our first dive site was the wreck of SS Eleni—a 99m steel freighter, which foundered against the coast of the nearby island of Patroklos where it had sought shelter in a storm. Despite heroic efforts by its crew and being on what appeared to be the leeward and sheltered side of the island, winds curving around the island pushed the vessel against the rocks. Its hull was breached, and as it took on water and started to list, the crew managed to climb onto the island, from where they were rescued the next day. The wreck now appears to be in two main parts, with the stern laying deepest at 30m and a debris field of twisted metal in the middle. 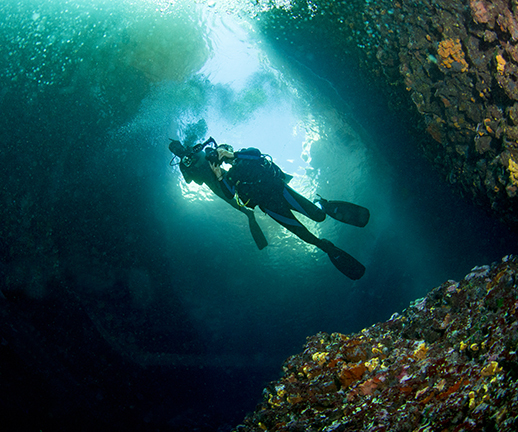 The bow stands up almost upright at 18m and I found this to be the most photogenic part of the wreck. It was a decent dive, but I will not pretend that piles of contorted and rusting steel with little or no historical significance excited me all that much. I tended to go looking for critters taking up refuge in the holes and crevices, in fact. But I did fancy the overhangs and rocks, as their sheltered sides were covered with sponges and soft corals in various colours. What I did enjoy, as I usually do in the Mediterranean, were the long and lazy lunches which leave one with no sense of hurry or worry in the world. As I also savoured the fresh produce. I dug into the Greek salad (of course) put before me with much gusto. Crunchy cucumbers, tomatoes rich in flavour, olives, feta cheese… it is such an uncomplicated composition and, being in Greece, the ingredients probably came straight out of a nearby vegetable garden. And I do not mind it being a very healthy meal, too. As I slowly sipped my coffee, my gaze wandering across the archipelago and glistening blue water, I drifted off again, pondering which historical events this very coastline, being the entrance to the Saronic Gulf, came to witness since the dawn of civilisation. One event that sprang to my mind was the Battle of Salamis, which was fought just to the west of modern-day Piraeus, and while perhaps not exactly in front of where I was now sitting, it happened close enough. The battle, which took place in 480 BC, was a major turning point in European history. It saw the Athenians decisively defeating the much larger invading Persian fleet, after which their king, Xerxes, retreated to Asia, with most of his army, assuring Athens its place as the cradle of modern European culture. The late afternoon dive took us out along the coastline of the nearby Arsida island just opposite the dive center, to a site called Blue Canyon. Here, there was a vertical fissure in the wall with a corridor leading into a wider space. Inside, the walls were covered with colourful sponges and algae. Looking outward, the rays of light from above and colours of the deep blue behind was a beautiful view. Outside the fissure, small reefs alternated with patches of seagrass and areas with boulders and rocks under which fish and critters were hiding. This was, as shallower dives often turn out to be, quite a relaxed and prolonged dive, with ample time to prod about and take a closer look at the marine life. It was a spent bunch of divers with sunburned faces who sank deep into the soft seats of the minibus that brought us back up to Athens while the sun was sinking low over the archipelago in the West, but the day was far from over. After a quick shower and change of clothes at the hotel, we went to the nearby metro station, the rapid-transit system that connects the conurbation of Athens and Piraeus. When in foreign cities, I do have a penchant for using public transport to gain an impression of the local population, as one can sit immersed in a random mix of all sorts of people going about commuting, visiting friends, going shopping or enjoying a night out on the town. The transportation system in Athens is clean and modern, and we did not have to wait long before we were on our way, off to enjoy dinner in the bustling downtown area. Our visit in Greece came about thanks to the admirable efforts and initiative of our host and guide, Avgerinos Vrazopolous, and his team. They are professionals behind ScubaHellas.com—a privately funded portal created to promote Greece’s underwater wonders and support its dive industry by providing interested dive travellers with an easy overview of the many options and ways to book dive holidays with many operators scattered across the country. I met Avgerinos some years ago, at the Boot show in Düsseldorf, Germany, where I was both puzzled and pleased to see an entity promoting Greece and Greek diving, as both have been notably absent for a very long time. I came to learn that Avgerinos heads a successful marketing agency and has also been putting his knowhow and resources behind his passion which is diving. His country could not get a better ambassador. As we sat under the open sky enjoying dinner and a cool beer, we got to hear about Avgerinos’ vision and his take on the challenges ahead. 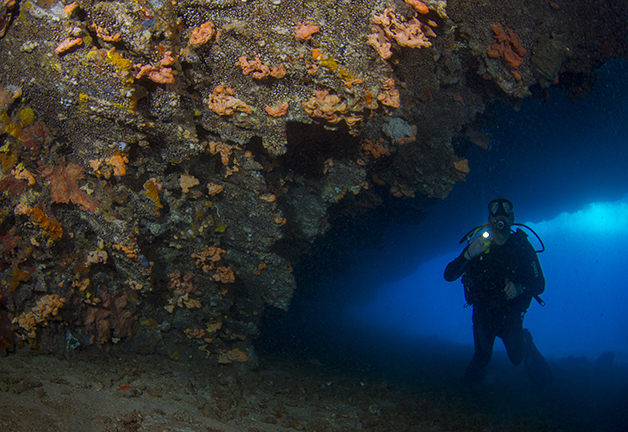 Seeing it for myself, Greece does indeed have a lot to offer, both above and below the surface. It only needs to be showcased. 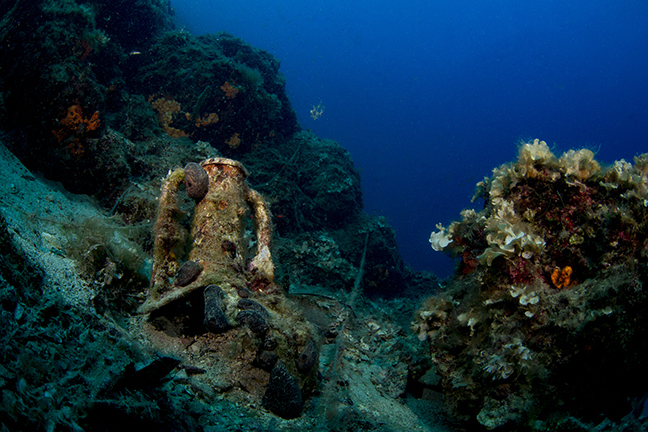 For decades, diving in Greece has been stifled by extensive bans, originally put in place to prevent looting or damage to its antiquities. While the need to protect historical sites and assets is quite understandable, the virtual blanket ban that was put in place for so long clearly went overboard, deterring a whole generation of divers from going to Greece. A shame really, since it is only a short flight from all other parts of Europe. The next morning, after not too much sleep, we were driven to Porto Rafti. A seaside resort town situated in Rafti Bay on the eastern coast of Attica, some 35km southeast of Athens, it is a place which is known for its fine beaches. The port, which is surrounded by hills, was a major trading place until the collapse of the Roman Empire. Just as we were coming down the last long hill, enjoying a magnificent vista over the port and the Aegean Sea in the distance, the bus suddenly pulled over, while still on the outskirts of town. Oh, this was the dive center, I found out. “AquaTeam,” the sign on the building read. We got off and entered the premises, which was spacious, tidy and quite well laid out. On the racks, hung quality brands and technical dive equipment, with rental and school equipment appearing to be of good standard and in good repair. On the far side, a huge mixing panel was mounted on the wall. This was clearly a facility that could cater well for all sorts of divers. Once properly briefed on the upcoming dive, everybody kitted out with needed gear, and several good Greek coffees later, we once again saw ourselves expectantly heading out to sea in a densely-packed RIB, bumping over the wave crests while clinging onto our camera equipment. I was stoked, because we were going to dive on a wreck site dating back to the antiquity, or rather its cargo, since the vessel itself, being made of timber, had long since deteriorated. It was not many minutes out of port before the anchor was set along the craggy shoreline, which dropped off steeply into the sea. 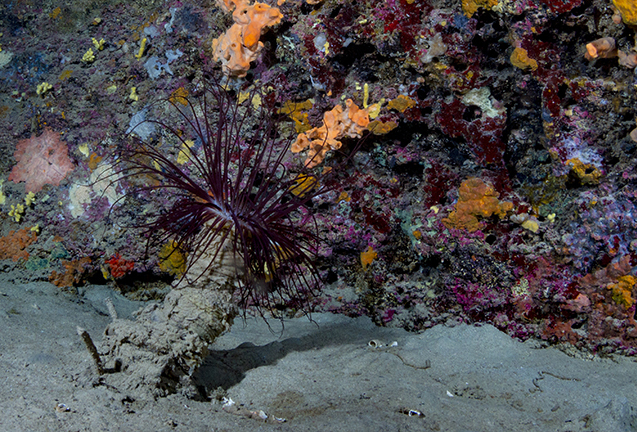 I slipped into the water with a back roll and went for a flat patch on the sea bed, some 10m deep, where I could sit and get buckles and straps properly adjusted and my camera rig properly configured, with the strobes pointed in the right directions and test fired. Once I was all set and ready to carry on, I saw our guide waving to get my attention from further down the sea bed. I pushed off the bottom, adjusting my buoyancy and letting gravity pull me effortlessly along in an even glide, while using my fins to steer me slightly above the sea bottom. Sticking out of the sand, were the unmistakable shapes of amphoras. That, dear reader, was a magnificent moment, and the realisation of what I had in front of me took long moments to fully appreciate. I was looking at artefacts, which were easily several thousand years old—dating from around 3,400 BC, I was told. I could just reach out and touch them if I wanted to, but I chose to keep a respectful distance, being extremely mindful of my buoyancy and posture. I hovered just over the bottom, and with slow and deliberate movements—as if I was performing some underwater variety of tai chi—I moved about very carefully and consciously, inching myself into position to compose my shots without any risk to the site. There were several patches of amphoras and shards that led me down to +35m for quite a while, deeper than I had intended to go. This was one of the times I was happy that I bothered to bring my own dive equipment. I am rather fussy about using quality kit, maintaining it and keeping it in perfect condition. It gave me some reassurance, as I was moving about, doing my thing down there, without a buddy close by, as one ideally should have. I had a large 15-liter tank, thank heavens. The 28% nitrox therein provided me with a much-appreciated buffer, enabling me to accomplish shooting a good series of photographs while keeping a reasonably wide margin for gas reserves, decompression limits and contingencies. With time to spare, I made my way up slowly along the slope and spent extra time around 5m breathing down my tank. I have made a habit of lingering in the shallows for a good while longer, as it is cheap, extra insurance against freak occurrences of decompression illness. Whether or not I broke the surface actually sporting a big grin, I do not recall, but I surely felt exhilarated. That was a big bucket list dive ticked off. So far so good, and it was not even lunchtime yet. For a surface break, anchor was heaved, and we sailed into a little protected cove nearby to enjoy some sandwiches, cake and soft drinks. It was one of those sacred breaks where time seemed to come to a halt and all the worries in the world were far, far away. Right in the mouth of Rafti Bay sits an island that looks almost like a skewed pyramid from some angles. I did not get the name of it at first, but an online search later determined it to be Rafti’s Island. Nothing above surface gave away that there was anything spectacular about it, but along its shoreline, there was a most exquisite cavern and overhang under which the walls were covered with a colourful tapestry of soft corals and sponges, giving it an almost cathedral-like appearance. The images should tell it all. Placed in shallow waters, it was another dive site where one could go about looking at stuff for quite a long time, as long as gas reserves lasted. I only saw the sporadic little fish skittering about, but from the ceiling, it was raining fireworms, which were apparently being knocked off their footing by our bubbles, comically resembling miniature paratroopers falling out of the sky. As I was rummaging about the sea floor, I came across a recess along one of the walls. I poked my head inside to discover the most magnificently coloured tube anemone strutting out of the sand like a delicate bouquet of flowers. Once again, I found myself moving about with the most utmost care, in order to neither stir up any particles nor to disturb the creature and cause it to instantly retract its elegant plume of purple tentacles. These delicate manoeuvres required no small amount of careful contortion on my part, and dead accurate control of buoyancy and posture, as there was not really enough room to safely squeeze into the space both my torso and my camera rig, which I had to hold out in front of me with arms extended, essentially as a point-and-shoot camera. To sum it all up, in the manner of just a couple of hours, we had gone on two completely different, but each in their own way, spectacular and memorable dives, making it one of the most wholesome dive days I have had in a very long time. Needless to say, I felt quite accomplished and elated as we headed back to port. Having worked up quite an appetite, I was also looking forward to a well-deserved lunch, which materialised in the form of a barbeque, which was already fired up on the porch in front of the dive store when we came back. That evening, while being only my third in Greece, was also my last chance to see a bit of Athens on this trip. Our group was taken to dinner in the Acropolis Museum, which sits right beneath the citadel plateau, with a spectacular view of the Parthenon.